Conceived by the founding fathers of the new Russia and in the mold of U.S. Independence Day, "Russia Day" has become just a new summer holiday — mainly because no one has ever managed to figure out who Russia gained independence from. For almost 20 years now, this day has been considered a holiday in Russia. It all began on June 12, 1990, when the Congress of People's Deputies of the Russian Soviet Federative Socialist Republic (RSFSR) voted in favor of the Declaration of State Sovereignty. People today find it all vaguely incomprehensible. However, back then, in 1990, the symbolic significance of the declaration was more obvious than its content. One by one, the parliaments of the republics of the Soviet Union had all passed a declaration of sovereignty, and the RSFSR could not remain on the sidelines. The congress delegates voted almost unanimously for the issue to be included in the agenda, yet the final text of the document provoked a considerable amount of deliberation, delaying its adoption until June 12. The very first presidential election of the Russian Federation was scheduled for the same date, due to situational and ideological reasons. For one thing, Boris Yeltsin's team feared that a change of date would harm their candidate's chances of securing a first-round victory, since voters would be more focused on the “dacha” (“country home”) season. The ideological motives ran far deeper. The construction of the new Russia was based on two ideological premises — first and foremost, a return to the traditions of pre-Soviet Russia. This accounted for the prevalent fashion for merchants and noblemen ("merchant guilds" and "noble assemblies" were cropping up everywhere at the time), as well as the reintroduction of the word “gospodin” ("gentleman," or, "mister"). There was also the return of the tricolor flag. It was almost immediately seized as the official flag of the RSFSR, although there were no legal grounds for such a notion until August 1991. In some respects, it was comparable to what was happening in Eastern Europe. En masse, the countries of the former Soviet bloc were shaking off the vestiges of socialism under the slogan "Back to Europe." The idea of returning "to the time before the Bolsheviks" became the symbol of the new Russian government. It is no accident that June 12, 1991, saw a referendum on restoring the Imperial name of Russia’s northern capital (from Leningrad to St. Petersburg). At the same time, the authors of Russian statehood wanted to dabble in a game of "founding fathers," as those who centuries before had laid the bedrock of the United States. This explains the decision to make the date of the adoption of the Declaration of State Sovereignty — with its inherent symbolism — a national holiday. Gennady Burbulis, chief ideologue of Boris Yeltsin's early presidency, attached great importance to symbols — the president of the new Russia had to be elected on the same day as the Declaration of State Sovereignty. That was part of the approach: We are building a new country, a new state, a new public domain and new traditions, so the date must bear an ideological hallmark. Twenty years later, still no democracy? The Congress of People's Deputies of the still extant RSFSR (as a republic within the Soviet Union) supported the game right from the start and even directly participated. June 12 became an official holiday by resolution of the Supreme Soviet in 1992. In 1994, it was substantiated by decree of Boris Yeltsin — after all, "Independence Day" could not hold legal force by resolution of a body that had been disbanded in October 1993. By that time, however, the date was beginning to lose some of its shine. And not for nothing did the informal name "Independence Day" become a knotty issue. First and foremost: independence of what and independence from whom? In June 1990, no one could have imagined that the RSFSR would one day secede from the Soviet Union; the collapse of the Soviet Union still seemed unthinkable. 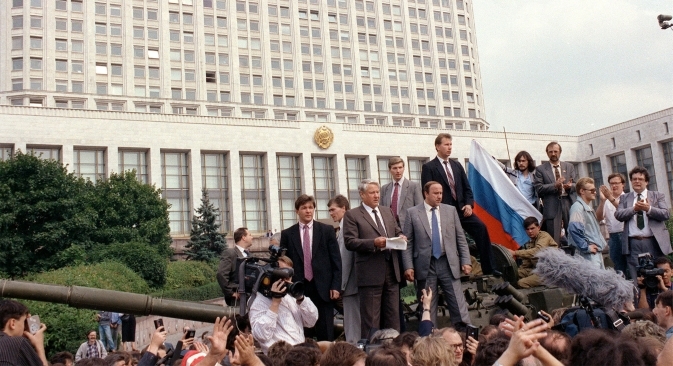 The Declaration of State Sovereignty was just a part of the political game between Yeltsin's team and the Soviet leadership. The second question concerned the role of Russia's new leaders in the collapse of the Soviet Union. In the mid-1990s, the description of the collapse as the "greatest geopolitical catastrophe of the 20th century" (in the later words of Vladimir Putin) had yet to be voiced, but many perceived it exactly as such. It was then that nostalgia for the Soviet Union began to spread throughout society. Also, by that time, the radical democrats in Boris Yeltsin's team were losing clout. The new generation of Yeltsin's entourage needed the holiday as confirmation of their entitlement to power. And Yeltsin's Kremlin was not particularly fond of remembering the circumstances and slogans by which that power had been attained back in the early 1990s. Thus, ever since the mid-1990s, June 12 has been welcomed (but not necessarily understood) by all — a kind of coffee-break sandwiched between the May holidays (Spring and Labor Day, Victory Day) and the summer vacations. "On the eve of the occasion, almost every regional governor issued a decree to hold a celebration in honor of Independence Day. And, for the first time, the holiday really was worthy of such description. The capital of Russia was adorned with banners and posters wishing everyone a 'Happy Independence Day!' Some cities held parades and concerts in honor of the occasion. And the Kremlin hosted the State Awards Ceremony." The final break from the original concept occurred in 1998, when Boris Yeltsin renamed the holiday: It became known as Russia Day. The Declaration of State Sovereignty, the founding fathers, and the march back to the pre-Bolshevik era were all left behind. Ahead lay the default, the end of the war in Chechnya, Vladimir Putin and the new, unknown Russia.